The Coming Mass Workers Party in the US? The most important thing about this presidential race is not what we’re seeing, it’s what’s missing: The organized voice of the working class. That shapes everything, in election season and out. That organized voice can only be heard through a party, a working class political party. So, the question of the hour is: How might such a party develop in the US, this weird country which is the only developed capitalist nation in which the working class has never had a party of its own? They include the threats of Islamic fundamental terrorist groups and blame this weakening on Obama’s reluctance to take unilateral military action, but it was exactly because of this reluctance of his that Corporate America installed him into office in the first place. After all, that unilateral military action in the form of the invasion of Iraq turned out to be a disaster for them, and they were terrified that it would be repeated on an even more disastrous scale by an invasion of Iran. So, the alternative was a president focused on “diplomacy”, in other words “the international community” (of capitalist governments). A columnist for the WSJ, William Galston, commented on Obama’s foreign policy this way: “The opposite of a mistake is usually the opposite mistake.” In other words, while Bush went too far in simply invading foreign countries with no thought to what would come later, Obama has made the opposite mistake (as far as the interests of US capitalism are concerned). He played the major role in informing Clinton’s thinking on foreign policy. 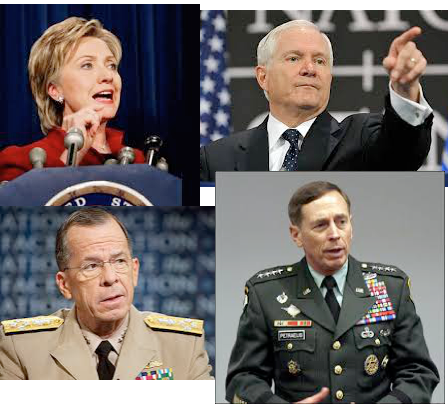 top left clockwise: Hillary Clinton, Robert Gates, David Petraeus, Mike Mullen. These four formed a team that represented the more aggressively militaristic strategy within the first Obama administration. Afghanistan and pushed for the “no fly zone” (really, no fly of anybody but the US military) over Libya. As Jake Sullivan, her top policy advisor when she was Secretary of State is quoted as saying in that same NYT article: “There’s no doubt that Hillary Clinton’s more muscular brand of American foreign policy is better matched to 2016 that it was to 2008.” This perfectly captures the shift in emphasis of the tops of the US capitalist class over the last 8 years. Domestically, the struggle at Standing Rock really shows what we will be facing. There, a mass struggle is being brutally repressed by police and sheriff agencies from seven different states under a 20 year accord that has never been used before except in the uprising in Baltimore following the Freddy Gray murder. Such mass police and National Guard turnouts will increase as will increasingly serious criminal charges. Plus, the racist far right is already emboldened and, no matter who wins, they will be mobilizing more. 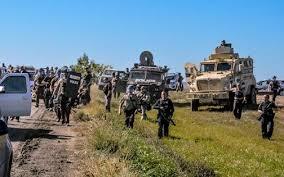 The state forces of repression have been brought out in mass in Standing Rock. Will this be the wave of the future? But there is more: Clinton is close to those capitalist strategists (such as General Stanley Mchrystal) who are calling for a universal mandatory service, something like conscription for a domestic peace corps. But in a situation with increased demands on US troops abroad – possibly including National Guard troops – such a drafted national service would likely start to shade over into keeping “public order”. In other words, it would likely start to look like a return of the draft – maybe in the disguised form of paying for college education. Then there is the call of Tony James, a top finance capitalist and top Clinton fund raiser, for mandatory personal savings plans for all workers – possibly deducting something like 4% from every pay check for some sort of 401(k), which would be managed by finance companies like James’s Blackstone Group. In the event of another financial meltdown, this would amount to a privatized bailout of finance capital while it would continue the drive to eliminate fixed income pension plans. Under these circumstances, a new movement of working class people would be forced into existence. It might start out localized, but it could not remain like that. Look at the Black Lives Matter movement, which started out as various local protests but is moving to become national. Such would happen on an even greater and more systematic scale. It would have to mean the coming together to hash out an understanding of what is happening and why and to hash out a strategy for building a resistance. Just as what happened with the Civil Rights and anti-Vietnam War movement of the ‘60s, some sort of national movement and national organization would be forced into existence. The difference is that this time it would have to be more thoroughgoing and have a more working class base because of the economic attacks that workers have been facing for decades now. 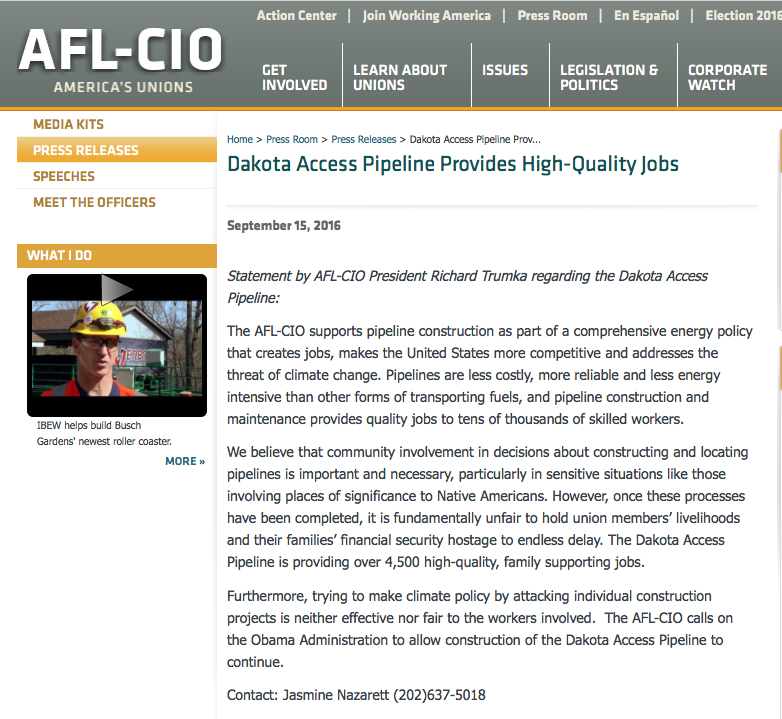 Statement of AFL-CIO supporting the pipeline. This is typical of the union leadership and it is an example of why there is such a vacuum in US politics. On top of that, the union leaders refuse to fight for the members on a day-to-day basis against the bosses. The development of a new movement, and in particular a new mass workers party, will necessarily involve a shake-up inside the unions. However, we have to be on guard that a layer of this leadership, along with the non-profiteers, will try to tame this new movement. What would that be – a national body that is made up of the most determined and thinking workers and young people? A body or organization that coordinated the resistance and met and discussed on every level from the national down to the individual work places, schools and neighborhoods? That would be the beginnings of a mass workers political party! A party born in struggle, built to advance that struggle. Eventually, it would have to decide on its orientation towards elections, with some probably opposing any participation, others calling for support for the next Bernie Sanders, and others explaining that this new party must run its own candidates. That will be a decisive moment, and any tendency towards either trying to ignore elections or towards supporting the next Bernie Sanders would seriously cripple this new mass workers party to-be. The next step forward for that party to-be would be to run candidates on an explicitly socialist program, one which ties in elections with the struggle in the streets, communities and work places. * — Note: As of this writing, it still seems that Clinton will most likely be elected. But even if Trump is elected, most of the perspectives are similar. Some differences are that he might actually pursue a more isolationist economic strategy, especially in the event of a recession. This would make the recession even worse. His election would give even greater impetus to the racist far right, but they will likely increase their activity whether he wins or not. He would probably speed up the privatization and other attacks on workers and the environment, but that’s only a matter of degree with Clinton. Same for state repression. It’s possible that if the tops of the capitalist class cannot get him more under control that they might engineer a “JFK solution”, which would throw everything into turmoil, but that and other similar unpredictable events have to be taken as they come.